'Desert Travellers' - an enigma? Description: Attributed to Joseph Austin Benwell. Unsigned. Inscribed on the reverse ‘Edward Julius Detmold’. 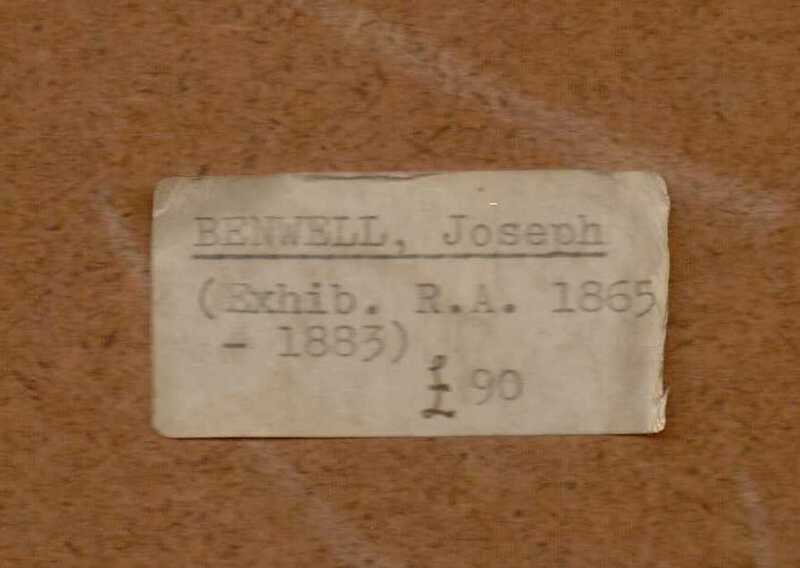 Small old-fashioned typewriter-written label on the back- ‘Joseph Benwell Exhib. R.A. 1865-1883 £90’. This small watercolour, only 4.8 by 6.7 ins (12.2 by17cm), is something of an enigma. Why is the name Edward Julius Detmold inscribed on the back? Edward Julius Detmold (1883-1957) was an artist associated with the Golden Age of Illustration whose works include illustrations for The Jungle Book (1908), The Fables of Aesop (1909), Arabian Nights (1924) and who exhibited with twin brother Charles Maurice Detmold at the Royal Academy at the early age of 13. The Detmold brothers were raised in London by their maternal uncle Dr Edward Barton Shuldham, who himself was interested in Oriental art and together with another uncle, artist Henry Detmold (1854-1924), encouraged and fostered their artistic talents. Could the painting be by Edward Julius Detmold rather than by Joseph Austin Benwell? Its small size is certainly more characteristic of EJD’s book-size illustrations rather than JAB’s larger paintings, but JAB was also a prolific illustrator for books and journals in his earlier life, specialising in groups of figures and visual vignettes. EJD specialised in animals and pictures inspired by nature, and his style is quite different from that of JAB. The figures of Arabs in this painting bear a remarkable resemblance in their character and stance to figures in early JAB black and white engravings. The colour gradation of the sky (sunrise or sunset) and shadows of the figures are characteristic of JAB’s later paintings. The name on the back is written in full, later signatures by which EJD signed his works (and not on the back) were either monogram EJD, E J Detmold or Edward J Detmold, rather than his full name. The two were not quite contemporaries, JAB died in 1886 when EJD was only 3 years old. Research into EJD’s family history indicates that it is possible the families knew one another, due to common links in India. EJD’s guardian, Dr Edward Barton Shuldham (1837-1924) was born in India, and his father Thomas Henry Shuldham (1801-1875) served in the Indian Army and was born in Calcutta. JAB was resident in Calcutta, and travelled widely in India in the 1840s and 1850s, illustrating the book ‘Our Indian Army’ by Capt Rafter (1855). With common links of residency in Calcutta and the Indian Army it is possible that JAB knew the Shuldham family. 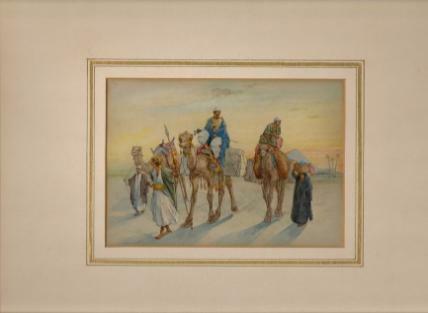 JAB was known for his paintings and drawings of camels- and Edward Barton Shuldham (EJD’s guardian) was a great admirer of oriental arts -could he have given the picture to the family, and later it came into the ownership of EJD? 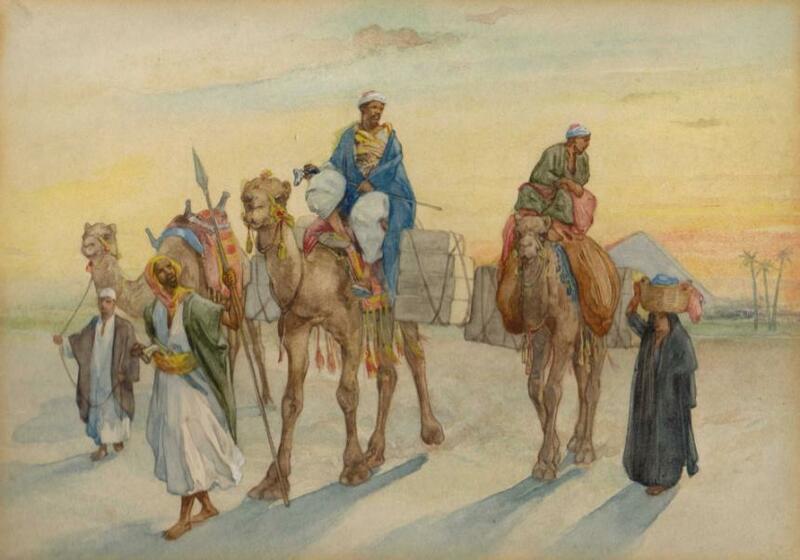 Could EJD have studied the camels’ form for some of his later illustrations (eg in Arabian Nights)? Some of EJD’s etchings feature camels eg ‘The Quiet of the Desert’,’A Caravan of Camels’ and another (but very different) ‘Desert Travellers’. Although the few human figures in EJD’s works bear no resemblance in style to those of JAB, who was better known for his figure characterisation. Another possibility is that someone later thought that the painting was by EJD, and inscribed his name on the back. The Detmolds were a merchant family from Germany, and that could also provide a clue for possible links between the families. In 1870 Joseph Austin Benwell showed at an exhibition in London for the relief of the widows and children of Germans killed in the Franco-Prussian War (The Graphic 1 October 1870). Also, his brother-in-law (sister Charlotte’s husband, Simon Michael Hayman (1812-1894)) was born in Germany. Many of JAB’s paintings have, over the years, been known by titles with slight variations in the wording. Inscription on the reverse of the painting. Who wrote this? Why is it there? Is it the signature of Edward Julius Detmold, or was it written by someone else? The ‘signature’ on the back does not seem to match known signatures of EJD (below) in terms of handwriting style, unless this is a very early work. Possibly it could be by an unknown artist or follower of JAB, or even by another Orientalist artist- for example it has been commented in the past (1880s) that JAB’s work ‘reminds one of Carl Haag’. 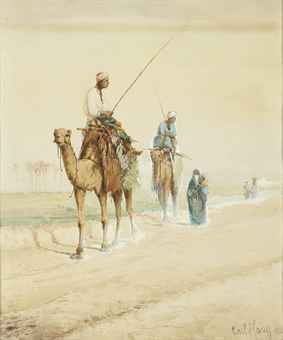 The painting (see below) ’Arab Travellers on an Egyptian Road’ (1882) by Carl Haag springs to mind. Whoever it is by, the picture "Desert Travellers" always seems to catch the eye of people coming into the room, despite its small size. The jury is still out, but watch this space.